ANY one will tell you that if you can win cases like this quickly then you do. The longer this goes on the longer there is a question mark against LFL's copyright and IPR. If LFL wins and AA has to pay £1m, £2m, £5m, £10m, £20m it really doesnt matter as AA will clearly not have the assets to repay them. Its unlikely LFL will ever recover their costs from this so its certainly not something they will profit from. The reality is the LONGER this goes on the LESS net funds LFL would see from it, since their legal bills go up and up and up. Yes, the longer this takes, the more money LFL will lose. Would be interesting to see those so-called pictures, but I doubt they will ever be released for the public to see, unless in a future book or something. It depends if Brian Muir was going to become a witness, whereupon his testimony would have perhaps sufficed. 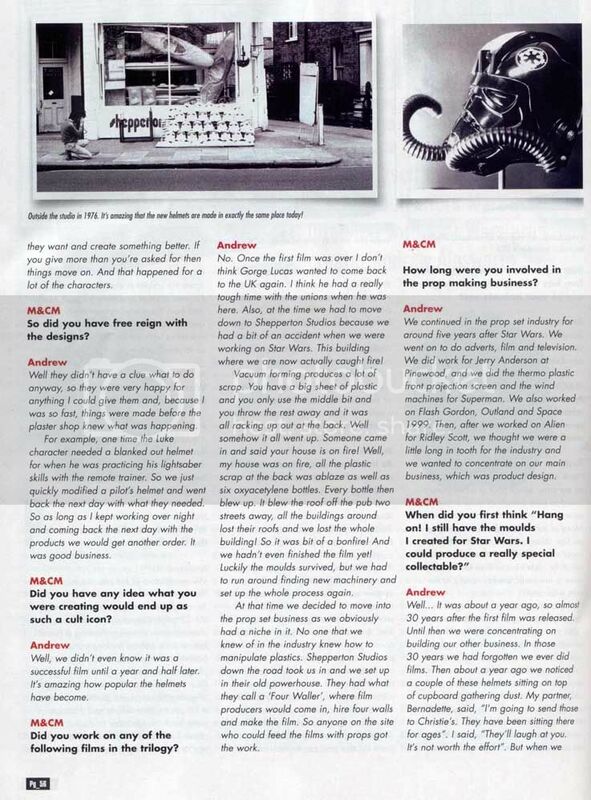 And this is the interview SithLord gave to Brian Muir. What's important is that Brian Muir was, at the time, the only accredited sculptor in England and had done very prestigious work for the House of Parliament, the Queen and the Queen Mother. Having such prestige, his testimony would carry a lot of weight since he's already so widely recognized. "Well, when I started off on the picture, the first thing I did was sculpted the body armor for all of the stormtroopers. That was everything on the stormtroopers apart from the helmet, really...." He did state in that same paragraph that he didn't do work on the helmet. 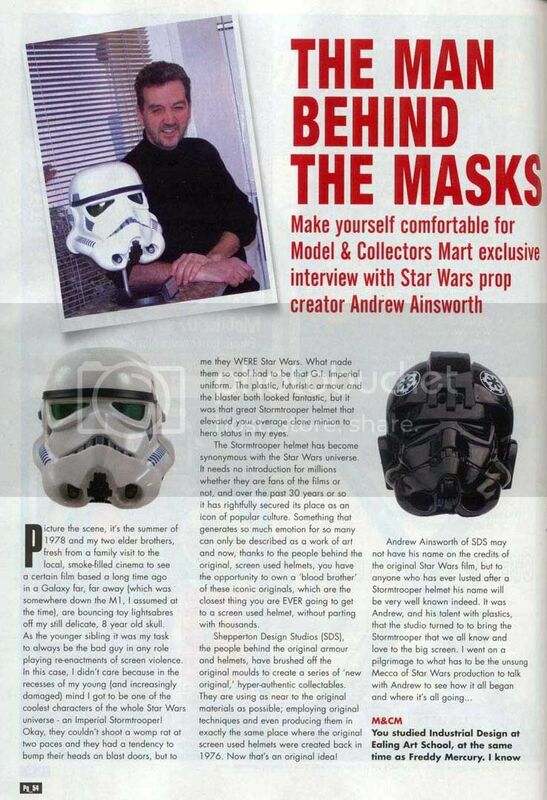 However, how can AA claim he owns the property of the Stormtrooper when he didn't sculpt the costume? Yes. And that statement alone would definitely cement that SDS has no rights to be selling Stormtrooper armor at all, since he has no creative rights over the design, no matter what he did to refine it for wear. Though... the helmet is another matter... and if another sculptor was brought in and LFL has pictures of that someone doing the sculpts and it not being AA... then SDS would be sunk. Regarding the other helmets... those were not sculpted, but put together from found parts... what rights would he have for those? Seriously and imo, I think there is something rotten in the way SDS presents himself... though, it would be interesting to see what the outcome of the trial will be. It's not uncommon for large companies to have a legal department. The costs would involve court costs, the salaries of that legal department, travel, etc. but the total cost might be less than hiring an external legal firm. Such a department would handle anything from licensing to intellectual property protection and risk management. Mac - LFL are using external lawyers - they'd be crazy to use internal legal resource for such a specific issue. NHM - youre right that BM's statement as a witness would hold some sway, but as with anything LFL need hard evidence (hence the importance of the photos). If they exist then LFL will present them and they WILL fall into the public domain (and I dont think for a minute that LFL would have any concern over this). Cog - the fact that sds nolonger provide the cog clearly shows theyve backed down on this. However in a complex case like this where both sides are counter suing, its not enough to "win" the case outright. However it does look like LFL can chalk a point won. Well, I just checked with the VP of Finance of the company I work for, and it turns out that litigation costs can be written off as operational costs. So it's not so much a matter of "wow it costs a lot to sue AA/SDS" but that LFL has more than enough funds from DVD sales, merchandising, toys, publications, etc. that they are in a position to write this off, even if AA/SDS was unable to pay. Mac- I'm sure you're right. My point earlier was LFL sees no benefit from delaying the case. If the fan community was able to identify the true sculptor of the Stormtrooper helmet, then it wouldn't be surprising that LFL would already have that information. I do not understand how AA can claim he created the Stormtrooper simply by owning the original molds. You start with a "positive" and then you apply the molding compound to it to create the first mold. From what we've seen with "The Making of" old footage, they normally worked with clay. 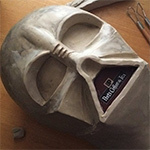 Should the molds deteriorate, you still have a positive to draw from. Of course, in AA's defense, one could say the original positive was discarded once the production began. 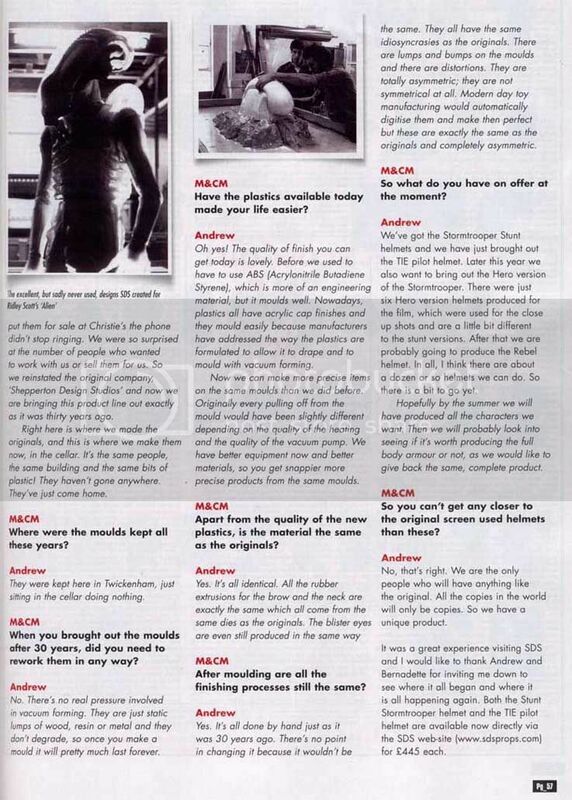 Mac - AA's saying he physically sculpted the Stormtrooper helmet with his own hands. The presence of the original moulds would support his case, but even without them I'm sure he would sai "this is mine - I physically made this so uinder UK law own the copyright"